Pembertonians recently voted on the best use of public money. Truth be told, if public money is truly being well-spent, it’s likely to be on something that no one really thinks about, something that runs quietly, smoothly, and efficiently in the background, allowing people to go about their everyday lives. Something like… might we suggest… public transit? Here’s our case for why Pemberton Transit, a truly awesome collaboration between Lil’wat Nation, Village of Pemberton and the SLRD, ranks as one of the best uses of public money in our neighbourhood. 2. You can count on it. In the spring, the SLRD, Village of Pemberton and Lil’wat Nation signed a 3 year partnership, and with 3 year budget assurance from BC Transit, that means you can count on the service. Explains DeJong, “We’ve refined the service as best we can in terms of efficiencies, and now the schedule is stable.” That means you can count on no seasonal changes. No sudden drops in service. 4. The local service is for everyone. The service is contracted out to locally operated Pemberton Taxi because it’s a much better use of tax dollars. Although the mini-van is not as easily identified as a Public Transit bus, it runs 7 trips daily between the Village of Pemberton and Mt Currie/Xit’olacw, and ties in to the Whistler commuter schedule. 5. A second car might be your family’s biggest money-pit. A monthly transit pass for an adult costs $95. The cost of fuel for a month of commuting is on average $192. By trading your second car in for an annual bus pass, you could save over $12,000 in insurance, maintenance and other expenses. 6. The bus drivers are really nice. Plus, they do all the work and you can read a book or catch a few extra Zzzzs. 7. It’s good for your eco karma. 8. You don’t have to make carpool chitchat when you’re still half asleep. 9. It’s affordable. Children under 4 ride for free, and seniors and students enjoy a discount. For adults, the local fare is $2.50 per ride, or $20 for a 10-pack. The Whistler/Pemberton Commuter is $4.50 or $36 for a 10-pack. Monthly and annual passes are also available, which drops the cost per ride substantially. 10. And it’s OURS! Pemberton Transit. Check it out. 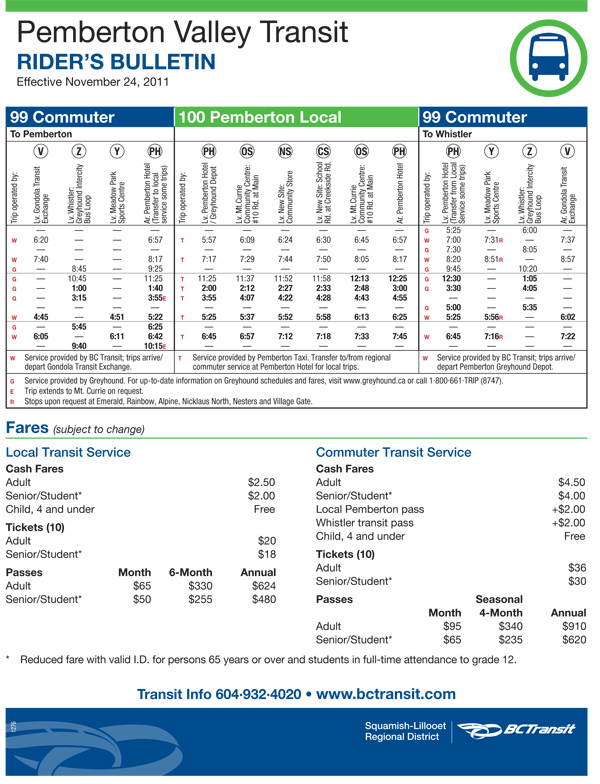 Download a copy of the schedule at http://www.slrd.bc.ca/siteengine/activepage.asp?PageID=91 or here (Pemberton Valley Transit – Combined Winter Schedule (2011-12) ), or at http://www.transitbc.com/regions/pem/. And hey, you don’t have to take our word for it. Here’s a letter to the editor from Pemberton resident, Robert Wezenbeek, about is positive experience missing the bus. Yes. Missing it. After arriving at post No. 1 last Wednesday (Sept. 26) to catch the bus to Pemberton, I noticed that the shelter was deserted. Apparently I had not kept up with the latest schedule change. However, he did not hesitate, immediately getting on his radio and asking the Pemberton driver (Mark) if he could come back. The supervisor on duty (Terry) overheard the conversation and took charge. He directed Mark to continue to Meadow Park and wait there while he came to the gondola exchange to pick me up and drive me to the waiting Pemberton bus at Meadow Park. I read a few negative comments about Whistler Transit over the last few months, so I thought that they deserve some praise too. Way to go Terry and Mark and the unknown driver of Connector 1 who set all this in motion. Terry also provided me with a Rider’s Guide, but unfortunately the Pemberton schedule is not included in it, so I guess I can use that as my excuse for missing the bus. As a bonus, the other commuters were not too upset having to wait for my personalized arrival. Thanks very much for the excellent level of customer service from a Pemberton commuter. Do you have an experience with Pemberton Transit you’d like to share? Comment here.